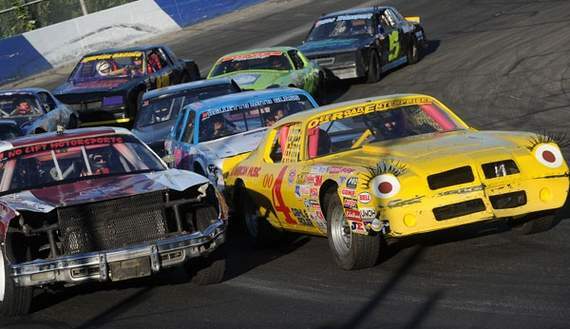 A group of Pure Stocks start a heat at Stockton 99 Speedway on Saturday. Marc Borges of Tracy won the 30-lap event in the division. STOCKTON - Dave Kong doesn't know for sure why he's undefeated racing in 2013 - but he'll take it. The Stockton driver won the Basic 4s division Saturday night in front of an estimated 1,000 spectators at the Stockton 99 Speedway for the second consecutive week. "The car has handled like a dream," said Kong, who also took the checkered flag in the trophy dash. "In racing, anything can change any day. I just hope it lasts because it's fun." Before the racing began, drivers from every division drove a memorial lap for the recent passing of Stockton drivers Tom Dahl and John Aries. Codi Barba took the lead on the fourth lap on the restart of the third of five yellows in the Pro-4 Modifieds and held off Jimmy Sorrel of Ukiah for the victory. Sorrel got the trophy dash win. Jay Lindstroth of Citrus Heights earned the Grand American Modifieds 40-lap win ahead of Mike Regelman of Ripon and Jason Philpott of Sacramento. Lindstroth also won the second GAM main and the trophy dash win, sweeping the division. Marc Borges of Tracy slipped ahead of Bobby Simpson of Stockton on the 27th lap when Simpson came loose out of turn two. Borges held on to take a thrilling win in the Pure Stocks 30-lap event that started with 19 drivers but was whittled down to 14 after several collisions. Simpson took home the trophy dash victory. Eric Humphries of Chowchilla won the NCMA sprint car division ahead of David Goodwill of Napa. Denny Burrell of Ripon grabbed the checkered flag in the dash. Racing resumes Saturday at the Stockton 99 Dirt Track with Delta Series Modifieds and BCRA Midgets along with a Late Model Open Show.